My friend Alex and I spent the past 3 weeks traveling and hiking through Slovakia. He is leaving for the States tomorrow. Before leaving, I decided to ask him few questions to find out more about his experience and impression of Slovakia. You can see photos from the trip by visiting the Facebook page of the website at facebook.com/slovakcooking. I was born in Philadelphia, PA. and grew up primarily in Virginia. I went to Virginia Tech for school and after a brief stint in California, moved to Maryland where I work at the NASA Goddard Space Flight Center. Aside from hiking, I spend a lot of time rock climbing, mountain biking, and kayaking. I recently bought my first house and I try very hard to garden and grow vegetables, but so far I have not had much luck. What about your past travels and hiking experiences? I have been to Europe once before when I travelled to Italy, Germany, and Czech Republic, but have otherwise never been out of the US. I have travelled to many areas of the US and have done a lot of hiking, however never a trip of this length. Most of my backpacking to this point has been of the 2-3 day variety. What did you know about Slovakia and its culture before you came? I had heard a fair amount from talking with Lubos over the years. I knew about the communist years and how things changed afterward. I also had heard a great deal about the village lifestyle – living in the hills, growing crops and raising animals, and just living a simpler lifestyle. What were your initial impressions when you arrived? Any surprises? There seemed to be two different types of housing: the big ugly panel buildings of the communist era, and the small houses outside the main downtown. I find the panel buildings to be very depressing to look at – some are fixed up more than others, but you cannot hide what they are. The small houses though I really like. They have a lot more style and shape to them than most houses in the US. Most houses in the US are a fairly simple design unless it is a very nice house where they paid for an architect. The stucco walls and textured roofs remind me a lot of my time in California. I prefer this sort of look to the aluminum siding and asphalt shingle you see on the east coast. This style of architecture was also present in many of the town squares which were built before the communist era. There are just now starting to be a couple of modern looking office buildings similar to what you would see in the US, but these are still a rarity. As to surprises, there were several things that were different, but the main thing that really surprised me was the shower. The showers here do not typically mount to the wall, they are just hand held and you sit down in the tub to rinse off. There is no shower curtain so I had to be very careful not to spray water all over the room. I am used to getting in the shower, turning it on full blast, and spacing out under the hot water for a few minutes to wake up in the morning. Bathing in Lubos’ dad’s shower was a very strenuous mental exercise. Describe your hike a bit. I flew into Vienna, where Lubos and his sister Petra picked me up and we went into Bratislava to stay at her place for the night. 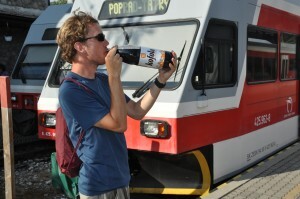 The next day we took a train to Banska Bystrica to meet up with Lubos’ dad. He drove us out to Donovaly where we started our hike in the Low Tatras. The first day was very long; actually all of the days were very long! The map gives times instead of distances and many of the estimated times must have been measured by a marathon runner! We hiked through the Low Tatras for five days staying at shelters along the way. 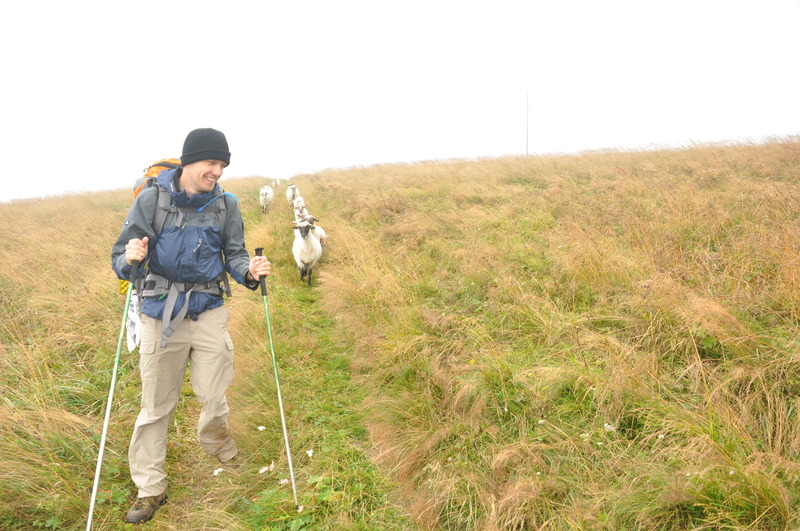 We saw some sheep that followed us down the trail, some mountain goats, and a dog that followed us for a couple hours. We saw a ton of amazing views since much of the hike was above the tree line. It was interesting to see all of the small villages nestled into the foot of the mountains. Since most people stay at the shelters we tended to see the same people every day and made a few friends. After the Low Tatras we went up to Poprad and spent two days hiking in the High Tatras. These peaks were much rockier and had some gorgeous mountain lakes. This area was much more crowded with tourists and was a bit of a jolt after the relative isolation of the Low Tatras. Our last leg was in Slovak Paradise where we rented a cabin and hiked some of the routes that followed gorges and waterfalls. This area was very beautiful, but even more crowded! I thought that we were done hiking at this point as the plan was to take a couple of days to see Spis Castle, and do a rafting trip down the Dunajec river, but due to bus connections and getting up to that castle, we actually had some pretty full days of “urban hiking.” The rafting trip was interesting because the guide mainly just made jokes about Polish people and his mother in law. In the US it would have been all about “this type of special bug lives here and eats this special flower”. We then had a long sequence of buses back to Banska Bystrica and to Lubos’ dad’s house. What did you think of the hiking in Slovakia? How does it compare to the US? In general, the trail system seems much more organized here. In the US there are a ton of trails everywhere but many are hard to find and not well marked. There are not always signs at junctions and the trail blazes are not standardized in any way. In Slovakia, it is much easier to plan out a hike and find the trail, but some areas of the trail are much better maintained than others. It also seems that they do not like to clear trail debris here. There were several places where a tree had fallen on the trail and instead of cutting a space in the tree as they would in the US, here they would just cut a little V to step on, or in one case we saw, lug over a pile of rocks from who knows where to build some steps up to the top of the log. 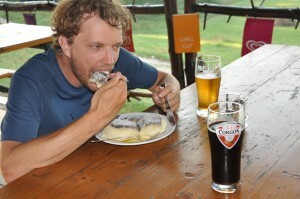 What did you think of the Slovak food? Because we were burning so many calories, I ate about double what I normally would so I had plenty of opportunity! I like the food here, particularly some of the pastries such as the buchty. In the US, pastries are not typically steamed, they are either baked or fried. The savory food I also enjoyed but there is not very much variety. Most meals consist of meat, potato, and sauerkraut. I found that after a few meals I was already having to repeat dishes. The other thing that jumped out at me is the lack of ethnic restaurants. In the US you could go to any town square and find Italian, Mexican, Chinese, Indian, Irish, and myriad other options of cuisines to choose from. In Slovakia the majority of restaurants are the typical Slovak fair, with the occasional pizza place and maybe one Chinese restaurant. There are also very few vegetarian options here, so it would be very hard to visit if you did not eat meat! How would you describe the food to someone who has never been here? All of the food is very heavy and very greasy. A dish that may be served on a pasta or rice in the US would likely be served with potato dumplings here (although you do occasionally see rice as well.) The primary vegetable is cabbage, usually pickled. It seems that there is much less tolerance of prepackaged foods here, at least among the people I have stayed with. I did not see any TV dinners and I never saw anybody use a microwave. One other thing an outsider might find unusual is that each restaurant typically only has one type of beer on tap, and it will be a pilsner. Many people choose a restaurant not based on the food, but instead based on which beer they serve. If you like ales you are pretty much out of luck. Another thing that is unusual to an American is that only the main dish is included in the quoted price and any condiments, or sides are additional. For example, you might order a Hungarian goulash, but the dumplings will cost extra. Or you may order a fried cheese, but the tartar sauce will cost extra. If you order a soup they will bring bread out, but count how many pieces of bread you eat and charge for each one. We were even charged an additional fee for putting cream in our coffee! Aside from the buchty, I liked the fried cheese, vyprazany syr, a lot, however I still maintain that this should not cost the same as a main dish (yet it always does.) I like the use of poppy seeds a lot. In the US you will see a few poppy seeds scattered around, but not nearly the same density that you see here. The poppy seeds are always an accent in the US whereas here they are often the primary flavor. I also enjoyed the halusky, which are potato dumplings served with either sauerkraut or sheep cheese. Did you have a favorite place to eat? Honestly, I had a hard time telling one place from another, but we did seem to eat at this one restaurant in Poprad a lot just due to convenience. The food was good, but their main beer was Kozel, which I was not a fan of. This place was typical of restaurants in Slovakia in the sense that it was very poorly maintained aesthetically. There was not a good sign, there was an ugly chain link fence you walked through to get in, there were overgrown weeds everywhere, graffiti, cracked cement, etc. Once you go inside they are usually very nicely decorated and cozy, but if I saw a place like this in the US I would never go inside, and in fact might just cross the street afraid wary of getting stabbed if I got too close. In Slovakia, this seems like it is the norm – as long as something is functional (roof of a house, a sidewalk, fence, etc), they don’t really care how it looks. It is much more utilitarian than the US, which is all about glitz and image. What is your impression of the Slovak people? The people we met on the hike were all really friendly and good people, but I don’t think any were actually Slovaks! Most were Czechs and there was a group of Hungarians as well. There was one group of Czechs that went out mushroom picking in the evening and made goulash in a large kettle and sang folk songs, which was pretty fun. Most of the Slovaks I interacted with were in restaurants or shops. I found that these people were nice enough but, for some reason, did not really seem interested in selling me things. In Slovak Paradise Lubos and I wanted to get a cabin but the woman did not want to rent us one because there was something wrong with the boiler in the shower room. We said we did not care, but she still did not want to give it to us. I guess this goes along with what I was saying about fixing up the restaurants – they would get a lot more business (from tourists at least) if they made their places look a little more inviting, but it is like they don’t really care how much business they do. Lubos suggested that this may be a relic of the communist era when your income was the same regardless of what you sold so there was no incentive to sell more. The grandmas we met liked to talk to us a lot, which I suppose is the same everywhere you go. It was hard for me not speaking the language – most people will see that I don’t understand them and move on, but the grandmothers kept trying to show me their craftwork and various ailments. Another thing I have noticed about the people of Slovakia is that everyone drinks fairly heavily. We met a fair number of drunkards wandering the streets trying to tell us their various problems. One of them had a fairly serious dog bite, but did not want to get it checked by a doctor since “there may be some sort of investigation.” This tendency could just be because it is cheaper to buy beer than water when you go out to eat I suppose. What would you recommend that the country improves for future visitors? The biggest thing would be the bus schedule. When you get to a bus stop there is typically a schedule posted, but it is generally ripped up or very old, and covered in esoteric symbols that have little or no explanation, but are things along the lines of “this bus does not run every other Thursday.” This is particularly frustrating when you are going to a small town that will have several transfers, each of which may or may not be running based on the litany of symbols. I have also seen several busses show up to a stop that do not appear anywhere on the schedule. There is a website (cp.sk) that will work out the schedule for you, but there is no terminal to access this at the bus station. There is also a window where they can help you work out a schedule, but this is only open for about an hour a day in the morning. The city buses require a ticket purchased from a news stand, but these stands are not open on weekends or holidays so I would not even know how to get on the bus. Walking can be equally confusing because there are hardly ever street signs at intersections, so when I get to an intersection it is never clear if I should turn or not. What were some of the high points of your hike? I think the best moment was right when we approached the final peak in the Low Tatras, Kralova Hola, and there was a festival up there of people dressed up in native outfits singing folksongs about the peak. It was really inspiring to watch and made for a very good end to that section of the trip. I was also really into eating cranberries along the route. There were raspberries and blueberries as well, but these are all over the place in the US. I have never seen wild cranberries on a hike before though! I also enjoyed the variety of places we spent the night: outside in my hammock, 30 people sleeping on the floor, a cabin, a grandmother, a penzion, and a hotel. Finally, I had a great time on the chains and ladders in Slovak Paradise. They don’t have very many places like that in the US! What are your future hiking and travel plans? The next big trip I would really like to take is to New Zealand. I have heard really great things about it and would like to hike around to all of the different environments they have there. I will have to convince Lubos though! Interesting comments, gave me and idea of what it may really be like if I should be so lucky to make this trip. Not sure I’d do much hiking, would really have to get into shape, but the both of sure make it seem like a good idea. I’m surprised that the food choices were so limited, maybe because you were in smaller villages and not the larger cities. Thanks for your comments and perspective. I enjoyed reading it. USA je veľká multikultúrna krajina. Preto aj výber jedál je rôznorodý. Pod Tatrami je málo pracovných príležitostí a mladí ľudia odchádzajú do veľkých miest. Cestovný ruch ” dostal zabrať” po nežnej revolúcii, kedy sa objekty sprivatizovali. Veľké turistické centrá ako napríklad Jasná v Nízkych Tatrách ponúkajú vačšie možnosti. Vy ste sa pohybovali ” v divočine”. Ochrancovia prírody sú práve za to, aby sa zachoval tento ráz krajiny. Po veľkej víchrici, kedy Tatry prežili pohromu, prebiehala diskusia, či Tatry znova zalesniť alebo stavať rekreačné komplexy. Tým by sa Tatry dostali do súkromných rúk. In addition, in small villages, the eating establishment does not do much business; home town folks usually eat at home and go to restaurant to have a drink, unlike in the US where “eating out” is much more pervasive. This also means that the menu and selection is not a big one. Usually a few basic meals, easy to prepare and reheat, nothing complex though still tasty. You don’t put a fancy stuff on a menu when you won’t have too many orders for it, and you don’t buy ingredients for a sophisticated meal when you won’t cook it. It’s just a business. Mirko, napísali ste to veľmi správne. Ďakujem. J.
I really enjoyed hearing Alex’s adventure in Slovakia. We visited Slovakia on a day trip while we were traveling thru so many countries and I know we missed the best part. Hiking would not be our specialty, but hearing about the food and beer brought back lots of memories of my Slovak Grandmother many years ago before all the countries were split and changed. Thank you for sharing Alex. Lubos, thanks for sharing pictures and stories about your hiking trip with Alex. Enjoy the rest of your stay, I’ll be hopefully heading back to Slovakia in about a month if doc gives me a go ahead after he takes off my cast next week. Just wanted to thank you and Alex for sharing this! I love reading about Slovakia, and the photos are terrific on the site, too! Lubos,Thank you for all the beautiful pictures & journal of your trip! I showed my mother ,94yr., all your trip pictures today. She enjoyed seeing Slovakia. Her mother & father were from Slovakia-will look up the town to tell you one day. Our buchty don’t look like the ones you ate on your trip. Ours are prune filled ,much smaller & served with melted butter & honey & poppyseed sauce ,served Christmas Eve. Yours looked very delicious though! How are they made? Thank you for showing us & sharing your trip & your country. Alex’s answers about food and the description of the restaurants made me miss it all even more. I particularly loved the french fries with tartar sauce and the cerny pivo and I loved the disinterested waiters, etc. A very different experience from overcrowded, overhyped American restaraunts. And, thanks for the recipes. I made the uhorky salat recipe from your site today for a get-together and it was very popular. When I lived in Slovakia for a few months in 1997 I ate that practically every day and I have been missing it ever since. Thanks for the connection to Slovakia through your photos, recipes, and newsletter. Have a good trip back to the US! Thank you very much for the fotos. they were EXTREMELY beautiful. I is to bad I am so old, I would have loved to be on the trip. Our Slovakia is so very beautiful and I wish I could convince more people to visit and observe God’s gift to us. Luboš, why was that Buchta so wet? Looked so delicious. I have beautiful memories of the hills of Slovenske Paradajz and have visited the Spišsky Hrad. I have a friend in Smižany and his girls love to visit the castle often. Stano has made a few oil painting of it. I am aquainted with Michal Smetanka, who makes and plays Fujara and Pištalky. He has a small muyeum next to the Royal Manor in Spišsky Hrhov, where he lives. Michal volunteers each ear to prepare for the opening of the castle. My trip on the Dunajec in 2006 was the first time anyone called me Ujo and made me feel old. It was the young boat-man. At the end of the trip he landed us at the dock. Then he came to me and said, Ujo, you don’t have to walk, I paid for your Horse Cart trip. Thanks again for the fotos. William: Your story gave me goosebumps because your heart and soul were so exposed to your love of Slovakia. I think Ujo is a term of endearment and the young boatman was being kind, I think he was truly respectful and must have been a wonderful young man. Thank you Alex and Lubos for documenting your trip. We spent a week in Slovakia (my late mother’s home country) last fall and traveled from Bratislava to Kosice and Snina. We took a day hike in the Poloniny National Park up to the Slovak/Ukranian/Poland border – it was an excellent adventure on a well marked trail, with beautiful views of the Carpathians. Neither of us speak Slovak, but with a phrase book and some basic words we were able to travel and navigate very well. I found some websites before we left the U.S. that were very helpful in planning our trip. The food is as you describe it but we loved it (and my husband is not even Slovak)as well as the pivo. I do think that Slovakia could build up an excellent tourist trade if the folks there paid attention to some of the details – on the other hand, I liked it just as it was and wouldn’t want it to change! tourist consultant! hey, that is a dream of mine, only I do not know where to begin! Nice hear from you on this site! Hello Lubos ! Greetings from Indiana Slovaks! Thank You, with grateful heart, I am so happy you and Alex are sharing all the beauty of Slovakia with us and the world here on the Internet! The photos and captions of you there make my heart and soul long to be there, when I visited the Tatry, my blood pressure was at it’s lowest, and I did not even need my medicine, such is the calming and peaceful feeling that overcomes one in that gorgeous place. Thank you soooooo very much for your generosity, You are truly Slovensko! Enjoy the remainder of your visit there, When is Sandra coming? today? Now we look forward to see photos of where you take her, and take lots of pictures of any and every food plate! hope you had a great trip. This interview was very interesting to read. I am a little old for hiking but hope to visit the town of my Mothers Parents in the Tatras, town is named Strba, I have many relatives there whom I keep in touch with!! PS-Love Slovak food, been eating it my whole life!! I’m with you Steve too old for hiking. My italian husband and I just returned for 14 days in Italy and we walked our legs off – especially in the area known as “The Cinque Terra”. It wasn’t hiking but the whole area is uphill so we had quite a workout. On our last night in Rome, while at dinner, a young man sat at the table next to us and began the conversation with “do you speak English”. Of course we said yes and he was thrilled because he did not speak Italian and he had just arrived in Rome a few hours before and was from of all places, Slovakia. Well, we became instant friends dispite the age difference and language was not a problem as he spoke english very well. His name was Michael and he works for IBM possibly in Bratislavia – not sure about that fact. At the end of this most pleasant evening we said good by with a handshake for the men and a kiss on each cheek for me – I was very touched. We also had the waiter take a photo of the 3 of us with both cameras but the only mistake I made was not getting his last name. I keep hoping somehow thru Facebook or this website we will connect again and stay friends. Good Night all. Interesting interview. I think if he spent more time in the cities he would discover more ethnic restaurants. I was in Zilina in August and saw “Burrito” which claimed to serve authentic Mexican cuisine and a place that claimed to serve Korean food. Of course, Kia has a big factory there. And there is Taco Rey in Bratislava. I would love to go to Slovakia before I die and see where my grandparents came from, but it is hard to pinpoint exactly where, Hungary, or Rusyn. Some of the recipes are the same but the names are not the same language I heard my mother and father speak. The cheese bread was called “Pagach” or sounded like that and pickled pigs feet, called Kotchanina, but my grandmother could read Russian, their alphabet and speak it and also speak Yiddish, she worked for Jewish people near the border of Russia and whatever country she came from, Saros or Saris, Lynbotin. We ate walnut bread, poppy seed bread, pork quite a bit, but no lamb, and very little beef except in Spaghetti. I am little bit disappointed by Alex’s impression of Slovakia but appreciate his honesty. Obviously my memories of Slovakia are highly idealised especially when I have done most of the hikes as a child. Good luck for the future travles!